KILE BREWER/STAFF – Doctrow will retire in June after working as the SFSC Museum of Florida Art and Culture curator for more than a decade. AVON PARK — After working for more than 30 years combined at South Florida State College, art professor Cathy Futral and museum curator Mollie Doctrow are ready to blaze new art-filled trails. Futral retired May 5 after serving 20 years as the art instructor at the college’s Highlands Campus. June 30 is Doctrow’s last day at the college after serving as the curator of its Museum of Florida Art and Culture since 2005. Both women said the students they taught and the colleagues they worked with provide many great memories of their time at SFSC. And both expressed their passion for the arts, which continues to inspire them on their respective journeys. A native of Asheboro, North Carolina, Futral has a bachelor’s degree in painting and a bachelor’s in art education from Appalachian State University in Boone. She also has a master’s in art education from Florida State University and a master’s in studio art from the University of North Carolina, Greensboro. Primarily a watercolor artist, Futral also paints in oil and acrylic. She has painted landscapes throughout her life, and her and her husband’s longtime residence in Frostproof includes 14 stained glass windows that she designed. Futral has taught art since 1974 to people of all ages, including elementary and high school students. And she has sold many of her hundreds of paintings at various art shows and to an array of art galleries. Futral first met her future husband, a Frostproof native, when they attended FSU together. But she recalled how she didn’t appreciate Florida’s landscape when she first came to the Sunshine State. “I missed my pine trees” of North Carolina, she said. “I saw palm trees and I didn’t love them.” Fortunately, she and her husband later met Tom Freeman, a Lake Wales artist who captures Florida’s natural allure in his paintings. “Jim and I would go out on his boat, and he would show us the beauty of the Florida landscape,” Futral said. She said she and Doctrow have presented a couple of art shows on Florida nature scenes together, and that the surroundings at places such as the Big Cypress National Preserve, Arbuckle Creek and Peace River have inspired her for about the past 20 years. “I want to create more paintings of them,” Futral said. While she explores new paths in retirement, Futral said she will often think about her students at SFSC. “I’ll miss the students, and all the ones who went on to excel,” she said. “And we’ve been blessed with three great presidents: Catherine Cornelius, Dr.(Norman) Stephens and now Dr. (Thomas) Leitzel.” Futral said the school’s administrators “are committed to a strong art department and the college. I have a lot of friends to stay in touch with and so many good memories, from loading a kiln to teaching a class. That’s the thing about SFSC: it’s small enough that you get to know every student you work with, even in the larger classes. You hope to inspire them to go on to greater things.” She said she and her husband plan to sell their Frostproof home and move to Sarasota in the fall. The couple intends on keeping their cabin in Boone, and Futral said she looks forward to conducting private artlessons this summer and painting parties in the fall. “I hope my new direction will be as fun as my time at SFSC,” she said. To learn more about Futral’s art, visit cathyfutral.com. 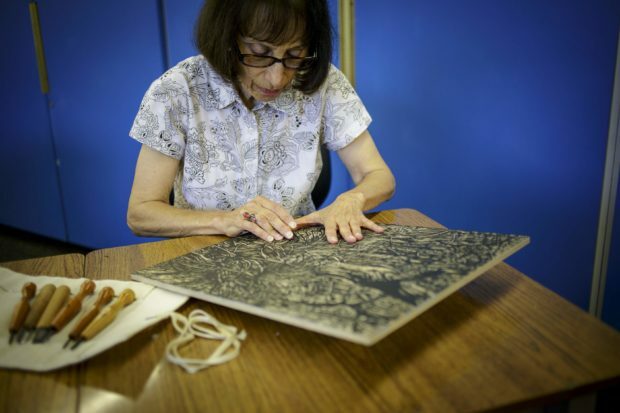 Doctrow, who hails from Southern California, recently recalled how, as a little girl, she would dabble in art with the brushes and other art supplies that belonged to her father, who was an aircraft engineer. Doctrow has a bachelor’s degree in philosophy and a master’s in printmaking, both from California State University, Northridge. She also took art classes at a community college, where she realized she wanted to be an art educator. “I naturally liked to make things, but I didn’t think I was an artist until I was halfway through college,”Doctrow said. “I just kept at it and just got better.”Over the years, she has shared that determination with numerous student artists, including those at SFSC and the ones she previously taught while serving as an art professor at Brevard College in North Carolina. She said she has relished working at SFSC because of its small size, friendly people and supportive administrators.“I was able to initiate the ideas I had,” Doctrow said. “We brought in major exhibits,” such as the one titled, “Cracker: Florida’s Enduring Cowboys,” that includes 109 photos. “I ran the program with the support of the administration, the community and the students. Little by little, we built a program of regular exhibits, workshops and speakers.” The 16-year-old museum’s permanent collection now has more than 400 works of art, Doctrow said. 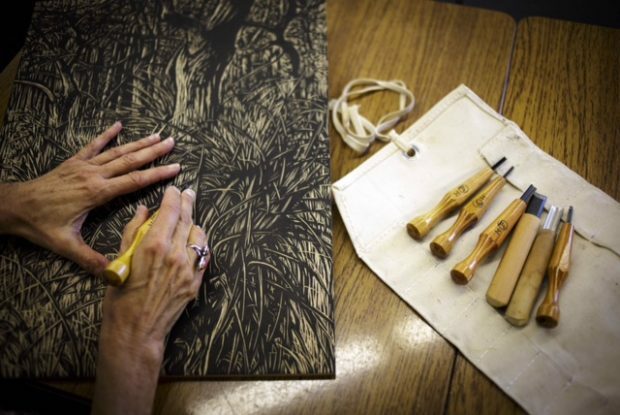 Besides relishing the art of curating, Doctrow specializes in woodcut art. Her art has been featured in a number of solo and group exhibitions and she is currently represented by a gallery in New Smyrna Beach. In addition, Doctrow has held art residencies at Big Cypress National Preserve, Everglades National Park, Archbold Biological Station in Venus and the Petrified Forest National Park in Arizona. Her Sebring home is near Highlands Hammock State Park, which, along with the Archbold site, afforded her the opportunity to become familiar with Florida’s scrub habitat and many of its wild creatures. In 2011, Doctrow was the creative force behind the Wildflower Wayside Shrine Trail, which winds through scrub habitat across West College Drive from her SFSC office. The trail has a series of six cypress wood shrine boxes that contain botanic information and artist renderings of some of the rare and endangered plant life along the Lake Wales Ridge. The shrine covers are polyurethane reproductions of some of Doctrow’s original carved wood blocks. Three similar shrine boxes stand along the continuation of the trail at the Archbold Biological Station. The property that contains the trail by the college once had been on the school’s land-development plan, Doctrow said.“I feel personal satisfaction that it’s become a part of the community,” she said of the trail. To learn more about Doctrow’s art, visit doctrow.com. One of those artists is Max Gooding, of Naples. Gooding, who earned an associate of arts degree from SFSC in 2009, said having the opportunity to learn from Futral and Doctrow was like winning the lottery. “I would not be the artist I am today without them,” he said. Gooding, who went on to earn a bachelor’s in landscape architecture at the University of Florida, works with watercolors and creates black-and-white drawings in ink. He said SFSC owns several of his pieces, including the first watercolor painting he produced in 2008. Garren said SFSC’s new museum curator will be Megan Stepe, who currently is an arts department adjunct instructor and the fine art gallery curator at Seminole State College of Florida in Sanford. And Futral said Avon Park High School art teacher Karla Respress will take over her position at SFSC in the fall. Futral said Respress is one of her former students at the college and taught the pottery night class at SFSC. “She’s very friendly and encouraging, and I think she’ll bring a lot of students to the college,” Futral said.